i have always wanted to work with oven bake clay. i think something about the soft white finish gives it a sweet, feminine look. 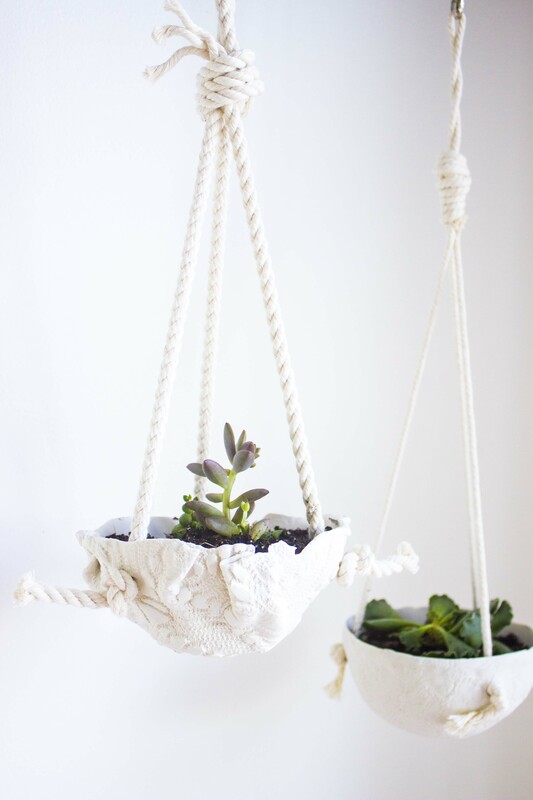 so when i had the idea of making a hanging planter, i knew i wanted to try this clay! and, i’m so happy i did! the results are exactly what i was hoping for - a planter that looks delicate and intricate, but is sturdy enough to hang and hold plants (and water!). with two packages of clay, i made 8 planters in just about 2 hours. this clay is so easy to work with, and this project came together quickly and easily (no massive fails, yay!). let's first start off with a list of materials you'll need for this project. - sculpey oven bake clay - one package makes 4 planters. - a small glass or ceramic bowl to use as a mold - mine measured 4.5" across. - succulents - i ordered mine from sanpedrocactus and highly recommend them! - extra soil for planting - i just grabbed some from my garden! - a straw or other small circular item to make the hang holes. i decided to make two types of planters. the first (shown above), is where i stretched and molded the clay to the bowl perfectly. the second, i decided to 'pinch' the excess clay to make a more hand-built looking bowl (shown three images up). i love how they both turned out! i also decided to use the rope just as it came for about half of the bowls, and then un-twined it to get 3 skinnier lengths of rope for the other half. i love how they look hanging side by side - one more bulky and the other more delicate. step 1: begin by taking 1/4 of the clay and kneading it thoroughly in your hands, until you have a soft and malleable ball. 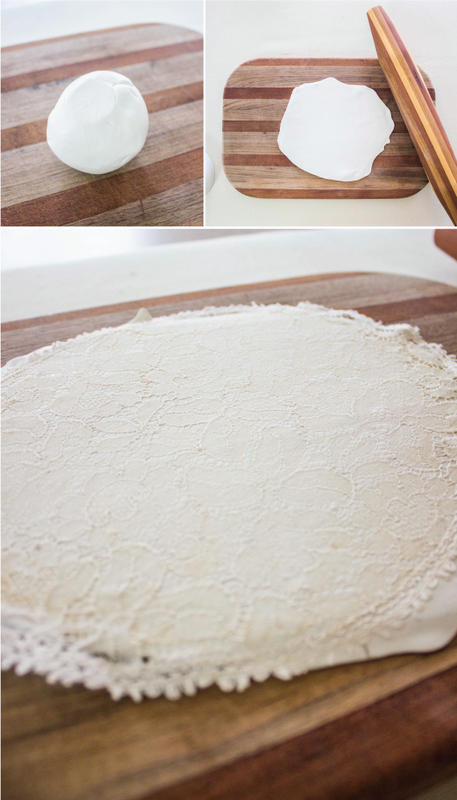 lay it on a flat surface and begin rolling it out using a rolling pin. you'll want to get it to about 1/4" thick. step 2: place a texture (i used a few different doilies) on top of the clay and gently roll it into the clay. remove the texture and make sure you're happy with the overall placement. step 3: being careful not to 'smudge' your texture, gently place the clay around the bowl mold you've chosen. you can either mold it to be a perfect fit, or 'pinch' the sides to make a more hand-built looking bowl. step 4: using a knife (be careful! ), gently slice away the excess clay at the bottom of the bowl. add this back to your unused clay to use next time. step 5: using a straw (or other small circular item), make 3 holes about 1/2" from the top to hang your planter from. i just envisioned a triangle and 'eyeballed' the placement best i could. step 6: place the bowl (still upside down) onto a baking sheet and bake according to the package directions. once finished baking, remove from the oven and let cool just enough to handle. gently 'pop' the clay off of the bowl mold and let cool completely. step 7: lightly sand any jagged edges to smooth out the top rim. step 8: cut two lengths of rope, one about 6" longer than the other. insert the ends of the longer piece into two holes and tie a knot at the end. take the shorter piece and insert into the last hole and tie a knot. hold all three pieces of rope (one loop and one raw end) together at the top until it hangs evenly and tie a knot, creating a loop at the top. you can then optionally wrap the rest of the loose end around the knot, using a glue to secure it. step 9: now you're ready to plant! *keep reading below for some extra tips! 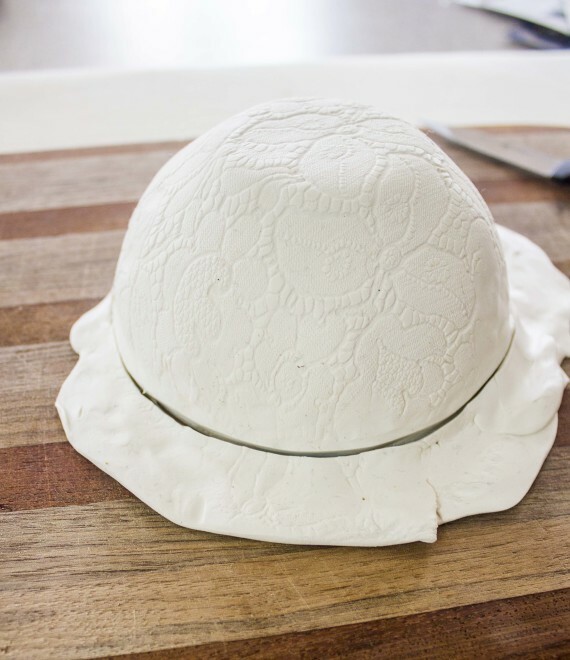 * if you goof up the texture while molding the clay to the bowl, you can finger press the lace back into it to cover up any smoothed places. doing this disguised my boo-boos perfectly. * it can be a little difficult to get the clay off of the bowl after baking. gently pressing from the bottom can help, and even a light spritz of cooking spray on the bowl beforehand helps. 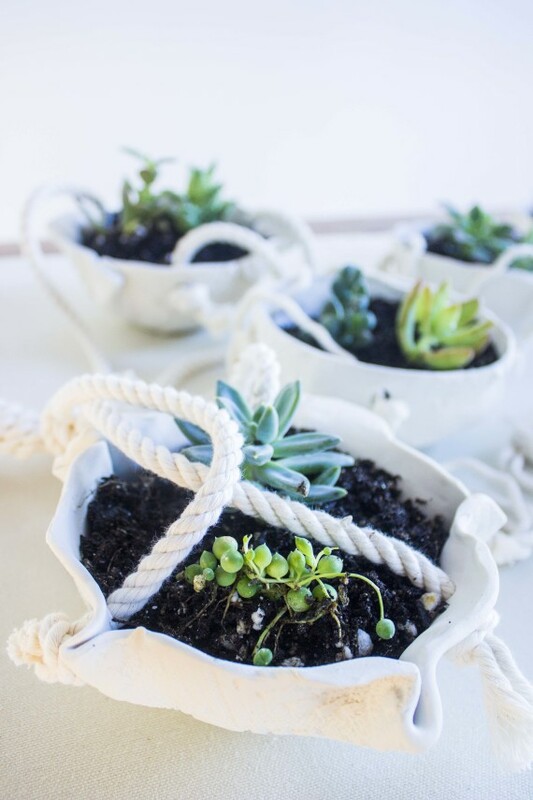 * consider adding the rope last (after planting) to keep the rope nice and clean looking. * i had some minor cracks on a few of mine, so i decided to take a little leftover clay, roll it out, and smooth it into the bottom of the pots. i then baked them again for slightly less time as a way to reinforce the bottoms and to make sure they would hold water. the package instructions clearly state to not overbake the clay, but i didn't have any problems with doing this at all. that's all! i hope you have fun fun fun! 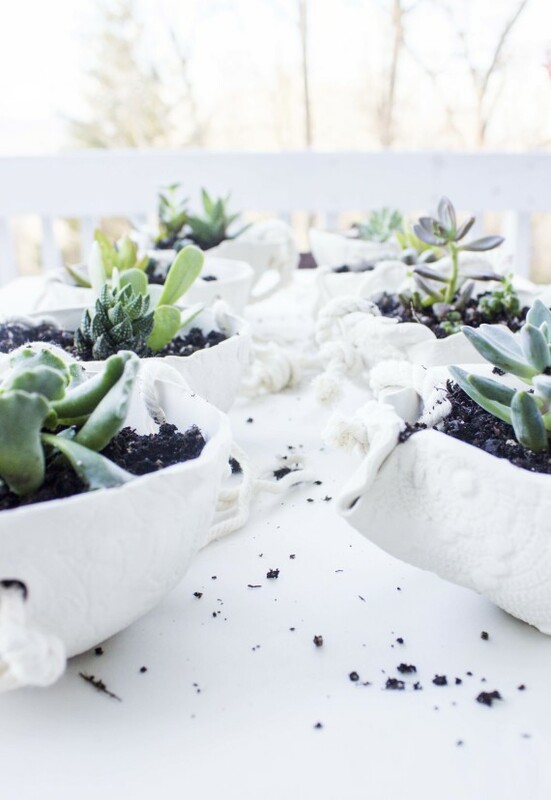 if you make this project, be sure to share your results with us over on instagram by tagging @goinghometoroost! 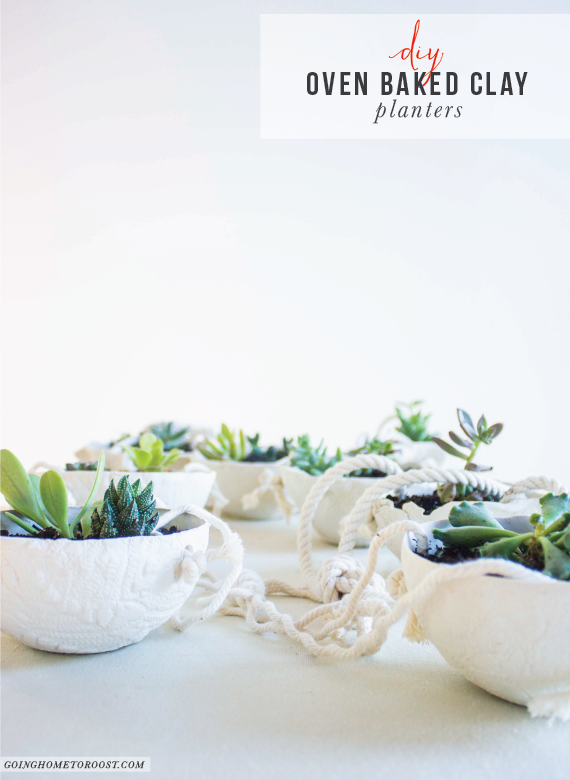 These planters are really beautiful! I’ve always wanted to make something with sculpey, and now I’m on a mission. I especially love the texture from the lace. These are so adorable, thank you for sharing how you made them. how are they holding up over time? How long did you leave them in the oven for baking?